In the 9-minute video, we get mouth-watering, partly tongue-in-cheek scenes of continental Europe’s quality-of-life — fantastic trains & pedestrian streetscapes,independent bookstores, delicious food, world-class museums, weekend getaway to Bruges, etc.– as the movie follows a couple through a riotous few days of E-book high living. It’s great stuff. I couldn’t help but be struck, however, by the sheer badness of my user experience in trying to watch this video. On my cable-modem connection at home — which costs an an exorbitant sum, by present-day French broadband standards — the nine minutes of video stopped and started across 30 minutes of my viewing time, such that before long I shifted focus to another task and was just glancing over at the video pane now and then when a few new seconds deigned to arrive. Of course, we can say that my connection is bad, and maybe my online-backup process is conflicting, and maybe Time Warner Cable has limitations on sites starting with “e”, and maybe the demand for the video is really high at this particular hour, the host is rationing access, yadda yadda. The thing is, though, my connection isn’t really bad, it’s normal to good. It’s video-capable in the last-mile, for sure; but across large Internet distances it’s subject to many latency delays like almost everything is. What’s really bad is that it a purportedly state-of-the-art Web video presentation would be implemented as a stream only, quite possibly streaming from a French host directly to me. This is sheer madness from the standpoint of user experience. (admittedly, I didn’t look into it very far to see if alternate presentations are possible. But I’m channeling past experience with other video clips here). Even if the host has limited bandwidth (not likely – Editis is one of Europe’s biggest publishing companies), the last thing you want to do is force a viewer to sit through the stuttering, piecemeal delivery that results. Please make the file downloadable, so the viewer can watch it undistracted when and only when it’s all there. Or distribute it to Youtube, Bittorrent, and/or other scaleable infrastructures. If there were a best-practices `”pattern language” for how to do web video, this would probably be among the first entries. The deeper point is that, technology aside, I myself am the cause of all sorts of interruptions: like, the kettle boiling, an urgent or more interesting message appearing, deciding to go walk the dog, etc. The video download should no more presume my continuous full attention than it should assume continuous full bandwidth. You could also say, life is mostly not full-attention. Social interaction, or walking down a street, or browsing a market, or working in an office, is a full-blown constant negotiation of many communication channels and actors. Full attention is a peculiar condition, of certain occasions such as religious ritual, theater and film stagings and screening, of interpersonal intimacy, of deep pleasure reading or intensive study. The Editis video addresses this reality beautifully, in my opinion, precisely by showing their e-book device embedded effortlessly in so many different real-world scenarios of the main characters. It isn’t a thing-in-itself, in a demo setting. The Editis video stresses, as did computer visionary Douglas Engelbart decades ago, how the technology is valuable because it augments our lives and intelligence, rather than displacing it or delivering something purportedly all new. Without this being the baseline vision, we are in the land of tech fetish objects worshipped by early adopters, with the rest of us unserved or subservient. I was recently at the University of Virginia for a week, taking a class at the UVa-hosted Rare Book School. Much of that time, I spent in various of the university libraries, and I was quite impressed by the service-oriented, friendly yet professional, and how can I say, fun and cool atmosphere. I mean, cafe space over much of the main Alderman Library’s big front lobby, with comfortable armchairs — I’d be owning one of those armchairs. Helpful staff set me up with borrowing privileges for the week. Ample computer facilities, set up for what you want to use: check. (many in the main lobby: I’d be owning one of those too). How great, right-on, and yet uncommon is that succinct vision-statement-in-the-form-of-a welcome? What do you do with the books you’re thinking about reading, are reading, or recently read? What should or might you do with these books, to maintain and change reading priorities, to maximize recall, to enjoy the cover art, etc.? I think the structure and presentation of this reading space, as it might be called, probably has an important effect on our reading and thinking. For me, cueing up books-to-read-next is a crucial activity, which might extend over many years between hearing of or acquiring a book, and finally reading it. Cognitively, it may be inseperable from reading. So I’ve used designated bookshelves, and sometimes variations on the proverbial “bedside reading pile”, plus many lists. (such as my Amazon wish list, or long term Reading List). The book shelf or pile has never seemed satisfactory, though, perhaps because these stow the books so only spine titles are visible — the same way books are stored permanently. Shelved books are back in the ranks — they don’t seem active, ready to launch, and if you have a lot of books, the cued-up books are not distinguished from any others. So, as an experiment, I decided to put together a little 2′ x 4′ reading rack to mount on the front of a bookshelf, pictured above. It needn’t be on a bookshelf, but this seemed convenient. 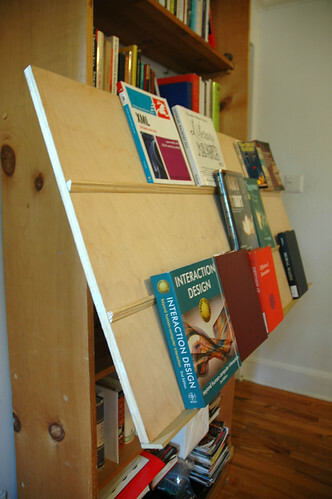 It’s just a 2′ x 4′ piece of plywood, some moulding, two hinges to mount it directly onto bookshelf front, and a hinged extender to push the bottom out and make the rack sloping. The dimensions and slope are such that small books (e.g. mass paperback) will fit in flat, but trade paper or larger will overlap the row above. Goal is for each book to be accessible, the cover art/title to be readable, while maximizing number of books per unit of rack space. The slope keeps the books laying in place, even if they overlap the ledge for the row above. I judge it… a success. I think reading is enhanced by keeping the recently read and to-read on hand for reinforcement. My prototype rack is set up to be visible from my primary workspace, just to the right of my sightline to computer monitor, so I’m sure to casually and/or unconsciously survey it often. Next time around, I’d probably make the rack the same width as the book shelf (3 feet here), i.e. if I were starting from scratch rather than using only existing wood pieces as-is. 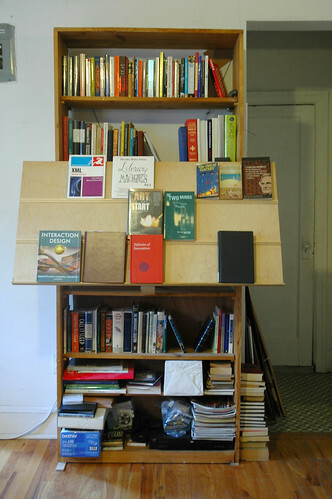 I like that front-mounting a book rack on a book shelf not only a) uses unused airspace, but b) hides the books behind it, thus achieving a further pruning or attenuation of the book load.